Stronghold Floor Model Cabinets | Shelving Inc.
Made for heavy duty use, these cabinets are a great addition to any shop floor. 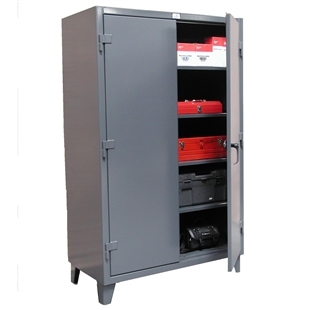 Store valuable tools or personal belongings behind the locked cabinet doors. If you're interested in purchasing multiple cabinets, contact our Resource Team for a quote by clicking the button below, or use the live chat feature during business hours.